Awards season is well and truly under way, and with the Oscars steadily approaching, people can’t seem to get enough of the red carpet – though sadly, the best dressed guys often get overlooked amongst a sea of samey suits and headline-grabbing dresses. Menswear is often built around rigid rules and strict codes, nowhere more so than evening wear – but what if you fancy switching things up now and again by adding a dose of personality to your formal looks? The good news is that the limitations of tailoring and evening wear are actually strengths; a good suit or tux is a blank canvas for you to customise. With that in mind, we’ve compiled the easiest ways to make your suit your own without looking like you’ve tried too hard. Armed with these handy tips, you can easily switch up the same suit for different occasions, whether it’s a spring wedding or client dinner. Although often overlooked, your jacket lapel is primed for accessorising. The most formal option available to you is a boutonnière. If you’re going down this route, you could always ask your florist for a sprig of flower to pop in your buttonhole (I actually know someone who habitually does this, relying on florists handing over their offcuts for free) – but there’s always the chance that it might wilt in a matter of hours, leaving your suit looking more mobile garden than your wardrobe’s finest. In our eyes, it’s far better to settle for a luxe, reusable solution that’s not in danger of going limp, such as a floral fabric pin – Parisian brand Lanvin’s are exceptional. With a wide spectrum of colours available on the current market, you could go bright and contrast it against your jacket, or try tonally matching it to your neck wear or pocket square. For example, a mid-grey suit worn with a pale grey tie and charcoal flower pin always looks sharp, no matter if you’re bound for a wedding or charity gala. At the other end of the scale, a simple metal lapel pin makes an interesting addition to a suit during the working week (dress code permitting) and for less formal occasions. Just remember to match it to the other metals you’re wearing (watches, belts, cuff links, etc.) and don’t over-accessorise – if you opt for a lapel pin, forgo the collar bar and tie clip. 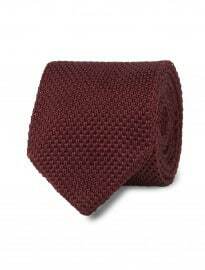 An easy way to bring character and personality to any suit is to opt for textured neck wear. While many formal occasions will restrict just how creative you can be with your styling, a tie or bow tie in an interesting material will add a subtle tactile edge to your ensemble, separating your look in a refined and understated way. Just like your choice of attire, your neck wear should be seasonally-appropriate. For spring/summer, consider lightweight fabrics such as linen, chambray and knitted silks, switching for rugged heritage fabrics such as tweed, wool, flannel and cord during the colder months of the year. British label Marwood has truly reinvented neck wear and is now widely considered one of the leaders in the field. Specialising in woven and lace-covered ties and bow ties that are more like miniature works of art, any design from Marwood is sure to bring an extra dimension to your formal attire. Elsewhere, Charvet’s artfully woven handmade ties are some of the best on the market, while Lanvin’s knitted silk designs are a perennial A-list classic. An underrated choice, silk scarves aren’t there to keep you warm – we’re talking pure decoration in the most luxurious sense. The slightly rakish touch a silk scarf brings to an ensemble (think icons like Lucien Freud) makes it a particularly debonair accessory that, while not always the easiest to pull off, promises major style points if you manage to nail it. Black, white, red and green versions are best for evening engagements (worn draped over the shoulders or tied loosely around the neck) and go well with deep coloured suits and tuxedos from midnight blue to black. Scarves in softer hues and more vibrant prints, on the other hand, can be used for daylight hours and work well with tailoring in white, light grey and pastel shades. Need inspiration? 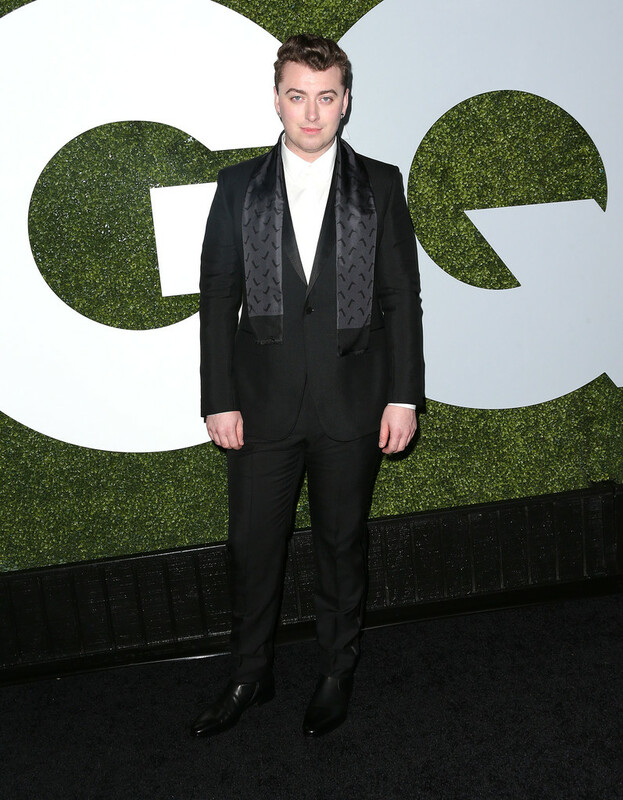 Sam Smith recently gave the classic black suit and white shirt combination a contemporary twist with a patterned silk scarf at the GQ Men of the Year awards, while Jared Leto has also called on a scarf time and time again to add a touch of insouciance to his look. Try a black tasselled scarf to keep it classic, or go 1970s rock ‘n’ roll with a Saint Laurent creased polka dot number. If you’re comfortable with patterns and prints, Hawes & Curtis’ lightweight paisley version for SS15 is truly eye-catching. A tux is a tux, and a suit is a suit. If your event’s dress code is strict, these rules are pretty unshakeable – after all, completely ignoring etiquette is anything but stylish. However, if the invite doesn’t explicitly state black tie, why not play with what’s layered underneath? For formal occasions, granddad collar shirts in cotton or silk can look striking under a blazer, whether they’re buttoned right up or left a little open. 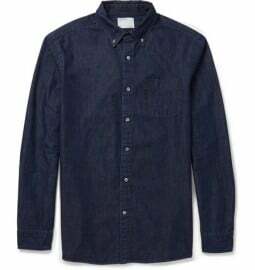 Both Haider Ackermann and Ann Demeulemeester are renowned for crafting slightly oversized granddad collar shirts that are sure to look just as good with your suit/dinner jacket off, as on. For the office and smart-casual events, you can afford to be slightly bolder with your choice. 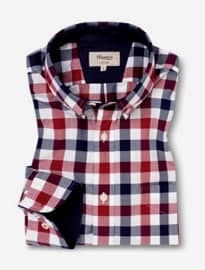 A patterned shirt in a timeless motif – think checks, polka dots, stripes and subtle florals – will instantly add interest and flair to a standard navy or grey suit, while smart button-downs in unconventional, textured materials such as flannel and denim (trending for SS15) can help introduce character and depth to an otherwise classic look. A distinguished choice when the dress code is slightly more rigid, the collar bar is another item that doesn’t really serve much sartorial purpose beyond, well, looking good (and making your choice of tie stand out). Favoured by gentlemen at each end of the style spectrum, from the superlative (Tom Ford, the cast of Mad Men) to the questionable (Gary Barlow), the collar bar shirt works with or without a tie, adding a bit of toughness to a tux or suit without screaming ‘fashion victim’. Truth be told, there’s no real limit to wearing them – we’ve seen ties worn under and over, and even without. T.M.Lewin and Reiss produce some nice affordable versions, but designer labels from Maison Margiela to Gucci occasionally have them in their collections too. There are no hard and fast rules about what shoes to wear with a suit or tux. And while we’d advise against something like trainers for an important social engagement, dress slippers are a stylish way to break apart from the herd. At this year’s Grammys, the always-stylish Donald Glover went sockless in a pair of Lanvin slippers with his tux, and it looked like the most natural pairing since the shirt and tie. Plain black velvet slippers are great, but there’s so much more choice out there if you want to be adventurous – from patent styles like Mr. Hare’s Belafonte, to Jimmy Choo’s classic Sloane in patterned silk, to Church’s velvet slippers with embroidered detailing on the toe. For a next-level evening wear move, Stubbs & Wootton specialise in customised, embroidered velvet shoes. We can’t think of a better way to announce your arrival than showing up with your family crest or initials (in varsity-style ‘sweater letters’) discreetly displayed on your footwear. Though most of us don’t find ourselves gracing the red carpet several times a month, that’s no reason to play it safe when the occasion does crop up. And with wedding season on the horizon, there are sure to be more than a few events where you’ll want to individualise your look and stand out from the crowd. But now we want to hear from you – how do you make your formal wear your own? Do you already use any of the methods above on a daily basis?